“I have always enjoyed travelling around the world and have done so for about 25 years; it is these journeys that have helped me mould the way I write, perceive and play music. It has now been about five years since my last recording, after which I began sketching out new tunes, drawing inspiration from my love of African music and re-ignited by subsequent visits to Zimbabwe and South Africa. “Having immersed myself in rock, soul, jazz, Latin, and Italian folk music, I then found myself gravitating towards music that more closely resembles ‘music of origin’ – the music that reflects its raw origins and that has some kind of traceable geographic map to its historical roots. “I felt a natural affinity with melodies which had a lot of emphasis on rhythm. 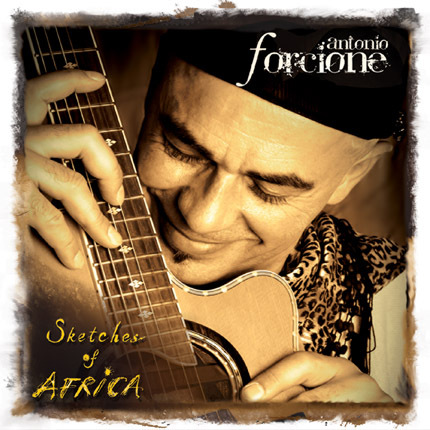 I see my album Sketches of Africa as a large canvas that generously shares its space with different stories, without being too self-indulgent; in other words I’d like to think that there is enough in it for almost everyone to sit back and enjoy. “There is a tune, Madiba’s Jive, which is a tribute to Nelson Mandela, and which I wrote after seeing an in-flight documentary about him and I was deeply moved by the detail of his life, choices, and what he represents. Musically speaking I have always pursued what appeals to me on a personal and emotional level. I have therefore spent many years performing, composing, arranging and recording that music which I believe in or that with which I feel a deep connection, without compromise. “ I composed Tarifa first, because it was from Tarifa, the southernmost tip of Spain – that I first laid eyes on the continent of Africa on the distant shores, which profoundly affected me. Sketches of Africa was recorded in Zimbabwe, Johannesburg, and London. Antonio found additional musicians on his travels and friends, who had heard about his new project, introduced him to other musicians. For the first time Antonio worked with a co-producer, his old friend and colleague, Chris Kimsey, the legendary producer of artists such as Tom Jones, Jimmy Cliff, Duran Duran, Ash, and many more.